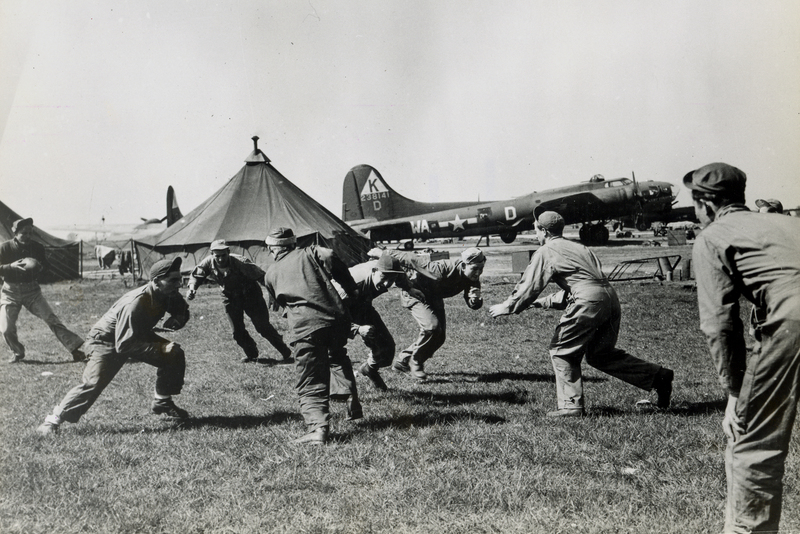 Men of the 379th take a break to play football beside the flight line at Kimbolton in the spring of 1944. The shadow of what the air crews faced lingers in the backstory of the B-17 parked nearby. That’s “Pansy Yokum,” a Douglas-built B-17G that joined the group right at the end of Big Week in February 1944. On March 8th, it was hit by enemy fire during the Berlin Raid and one of the waist gunners was killed in action. Shortly after this photo was taken, this B-17 vanished on July 9, 1944. The crew failed to form up as the 379th assembled for the mission, but apparently the pilot, Lt. Hugh Frye, decided to press on. They either joined up with another group, or went off in search of the 379th. Either way, the Fort was hit by flak over France, limped back toward England, only to crash at sea off Le Havre. All nine aboard perished, including the 23 year old bombardier, Lt. Orval Epperson, a small town kid from Neosho, Missouri. He was his family’s only son. In November 1942, the 379th Bomb Group was activated at Gowen Field Idaho, just outside of Boise. The crews trained incessantly through the winter and early spring, then deployed to England in April 1943. 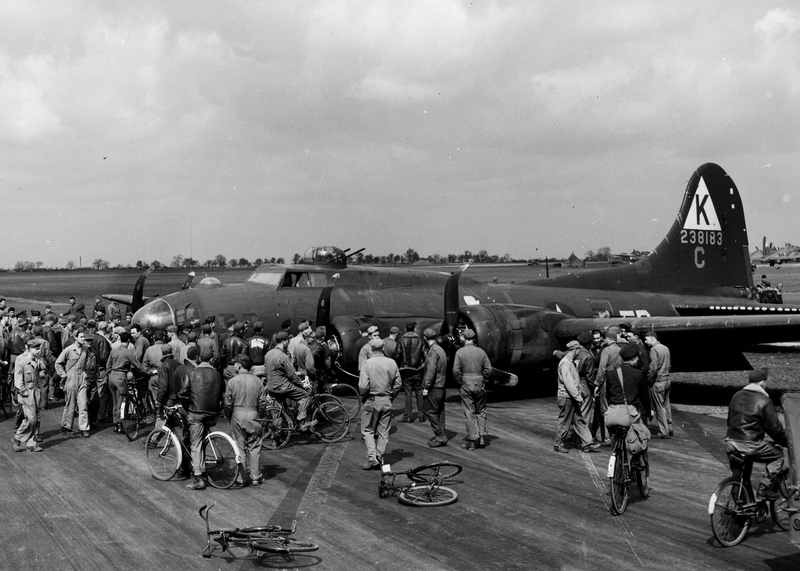 The group arrived just as the 8th Air Force was ramping up for the ’43 strategic bombing effort against Germany. Men of the 379th entertaining local English kids and their families at Kimbolton. The B-17 was “Tampa Tornado,” a battered Fort that had first seen service with the 303rd Bomb Group before joining the 379th in September ’43. It was retired from combat service in October, and was the aircraft the group used for tours when civilians came on post. Commanded by LTC Maurice A. Preston, a Class of ’37 graduate of West Point, the 379th was a sharp, well-disciplined outfit that would soon prove to be one of the elite groups of 8th Bomber Command. Preston held command until October 1944 when he moved up to take over the 41st Wing. He was a combat leader all the way, flying forty-five missions through the worst phase of the air war over Europe. He led the 379th during the August ’43 Schweinfurt raid, and returned to that city the following spring. He went on to have a very successful USAF career, ultimately commanding both the 5th Air Force in the Pacific and all USAF forces in Europe during the height of the Cold War. The group performed so well in combat that it earned two Presidential Unit Citations, and was recognized for its bombing accuracy, low abort rates, tight formation flying and bomb tonnage delivered on targets. The aircrews pioneered new formations and new bombing tactics that were later adopted throughout VIIII Bomber Command, and completed 300 combat missions faster than any other USAAF heavy bombardment group in England. The group paid a brutal price during its two years in combat. Altogether, 141 of the 379th’s Forts went down over Europe. 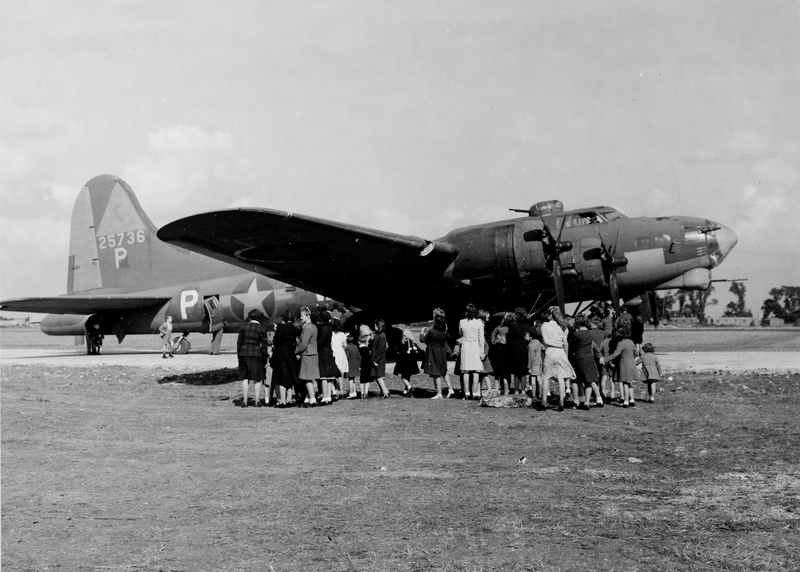 “Lost Angel” returns to Kimbolton on April 10, 1944. This Fort joined the 379th in February ’44, and this crash landing was one of at least two crews of the group experienced in her. On September 28, 1944, Lost Angel and the rest of the 379th ran into scores of German fighters on a mission to Magdeburg. During the bomb run, another nearby B-17 (Queen of Hearts) took a direct AA hit that touched off one of its fuel tanks. As it fell, the tongue of flame it trailed engulfed Lost Angel so completely that the tail gunner thought their B-17 had been hit as well. He bailed out and was taken prisoner. Just after the bomb run, the fighters struck. Lost Angel’s navigator later wrote, “Most horrible sight I’ve seen. Sky filled with burning planes. Too many to count. Had to look away.” For details on that mission, see, “http://b17navigator.com/dads-log-book/mission-no-seventeen-september-28-1944/&#8221; Lost Angel was repaired repeatedly and sent back into battle. After the September mission, it was sent to the 384th Bomb Group. Miraculously, it survived the war, only to be scrapped in October 1945.